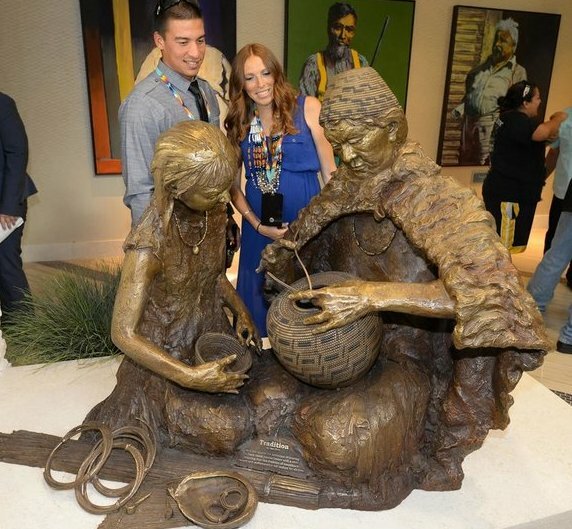 Six historically significant bronze sculptures were unveiled yesterday at a special tour and celebration for tribal members at the newly expanded Chumash Casino Resort. 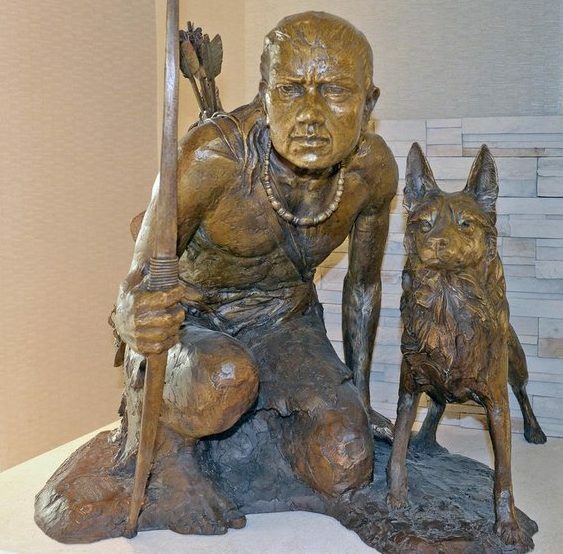 The tribe commissioned nature and wildlife artist Dan Chen to create sculptures that pay tribute to the way of life of the Santa Ynez Chumash ancestors. The sculptures are housed in the entryway to the casino, and each pays tribute to the way of life of the Santa Ynez Chumash ancestors. “Heritage” depicts beloved ancestor Maria Solares sharing stories with a child, symbolizing how she preserved tribal history, culture and language for posterity. “Tradition” is a sculpture that shows a tribal elder sharing the technique of weaving a finely coiled juncus basket, reminding us that Chumash were known for remarkable basketry techniques. “Generations” shows a young mother lovingly caring for her child in a tule cradleboard before preparing acorn, one of the most important foods for Chumash people. “Provision” is a bow hunter with his bounty of quail concentrates on the hunt alongside his dog. In “Celebration,” the Bear Dancer honors the Bear, the most powerful animal in the Chumash world, and brings healing to the earth and all its people. “Flames of Victory,” is the largest sculpture and serves as the center anchor of the sculptures. Through the flames of adversity, the ceremonial fire highlights the diverse Chumash world and tells the story of the tribe’s heritage. The sculptures were completed in four stages from conception to one-fourth scaled models known as “maquettes” to full-sized sculptures in clay to the final step of molding and casting the sculptures in high quality bronze. Located on Highway 246 in Santa Ynez, California, the Chumash Casino Resort is an age 21-and-older venue. In addition to owning and operating the Chumash Casino Resort on the tribe’s reservation, the Santa Ynez Band of Chumash Indians also owns Hotel Corque, Root 246 and the Hadsten House in Solvang and two gas stations in Santa Ynez.